Recording high-quality videos with Smartphones and consumer-level cameras is easy, but unfortunately the same can't be said for the sound. The camera microphones often record low-quality audio and they pick up background noises that can make the video unwatchable. In case you were looking for a quick way to mute or remove the audio in your videos, you came to the right place because in this article we are going to show you how you can mute audio in Windows Movie Maker or add new audio files to videos. We're also going to provide you with an alternative solution that lets you have more control over the audio editing process. Part 1: How to Mute Audio in Windows Movie Maker? Muting the audio in a video clip is simple, regardless of the video editing software you're using. Windows Movie Maker lets you mute audio in just a few steps, so let's see how you can mute videos with this video editor. Step 1: In order to start editing a video, you must first import it into Windows Movie Maker. Click on the Add Videos and Photos icon in the software's Home tab and proceed to select the clip you'd like to mute. Click on the Open button in the Add Videos and Photos window and your clip will be imported into the software. Step 2: After you added a clip to the storyboard you can preview it in order to decide which parts of the video you'd like to mute. Click on the Edit menu in the software's ribbon, to gain access to the video editing tools Windows Movie Maker has to offer. If you would like to mute only a portion of a video clip, you should position the playhead on the storyline at the exact location in the video where you want to make the cut and then click on the Split button. Step 3: Make sure that the clip you want to mute is selected and click on the Video Volume icon on the left side of the Edit tab. Drag the slider all the way to the left to mute the audio. Click the Play button in the preview window to make sure that video's sound is muted. Windows Movie Maker also lets you replace the existing audio clip with a new one. Once again, this process is easy and it can be completed in a few steps. Step 1: After you've muted the audio, click on the Add Music icon, that is located next to the Add Photos and Videos icon in the Home tab. A drop-down menu will appear offering you to select music from an online source or to import an audio file from your computer. Moreover, you can select the starting point of the song you're importing so you don't have to adjust the position of the audio file in your project manually. In order to do this, you just have to position the playhead at the desired location and select the Add music at the current point option from the drop-down menu. You can change the position of the audio file by dragging it to a new location in the storyboard. Using MP3 or WMA audio file is recommended since other audio file formats may not be compatible with Windows Movie maker. Step 2: The audio file you imported will be automatically added to the video clip on the Storyboard. Click Play in the preview window to check if you like the result. Head over to the File menu and click on the Save Movie option. Windows Movie Maker will offer you a number of different options and if you'd like to save your video to the computer, you should select the For Computer option. 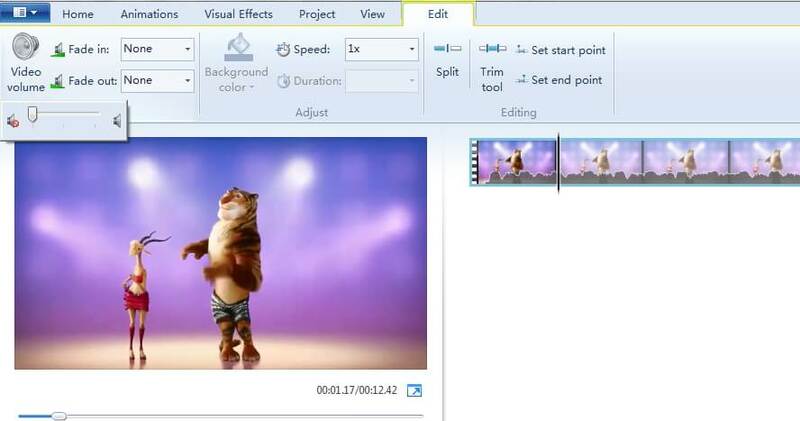 Windows Movie Maker has been discontinued a while ago, and its video and audio editing tools only enable you to perform basic video editing tasks. We suggest using Wondershare Filmora if you would like to mute or replace audio files in your videos because it offers more powerful audio and video editing features. Here's how you can mute or replace audio files in Wondershare Filmora. Step 1: Import the video clip into the software, by clicking on the Import button and then selecting the Import Media Files option. If you want to replace the audio of the clip you can also select the new audio file from your hard drive and click on the Open button. Filmora offers a rich royalty free music library, you can use if you already don't have the music you want to add to your video. Step 2: Drag and drop the video file to the timeline and then right-click on it. Select the Audio Detach option from the context menu. The audio file will appear in the newly created audio track, and you can just click on the Volume icon located at the begging of the audio track to mute that audio track. For more details, check our guide about How to remove audio from video in Filmora on Windows. If you want to add a new audio clip to your project and replace the old one, you should select the existing audio file and press the delete button on your keyboard. You can then drag and drop the new audio file to the timeline from the software's Media Bin, or the Music tab, in case you decide to use songs featured in Filmora's music library. You can cut, trim or adjust the start and end position of the audio file or use some of the audio effects the software offers. When done, click on the Export button and select the output format that is most suitable for the project you're working on. Videos that have poor sound quality won't impress anyone, but you shouldn't worry because muting or replacing audio files is a task that requires almost no effort. Windows Movie Maker can be used to quickly mute an audio file, but if you want to have access to more professional audio editing tools using Wondershare Filmora is a much better option. What's your favorite method of replacing audio files in videos? Leave a comment and let us know.